The Eclipse 200 includes an integrated HMI panel and controller that allows the Eclipse 200 to handle more complex tasks such as configuring print jobs from the panel and/or communicating with external systems (PC’s or other lab automation instruments) to accept print data from those systems and send print results to those systems. The Eclipse 200 also adds motion control hardware to automatically rotate the Plate between four positions. This allows the system to follow a sequence to automatically apply up to four Labels per Plate (centered on each side of an SBS footprint plate. 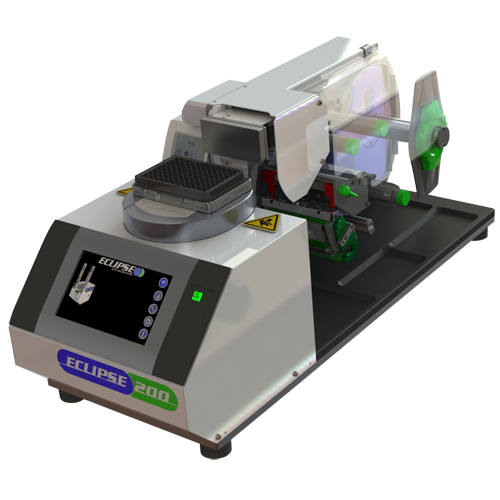 The Eclipse200 also includes a manual adjustment to raise/lower the Plate Nest to control the position of Label on the Plate in the vertical axis.